"The best selling The Tabernacle ebook brings to life the Old Testament teaching on the Tabernacle in the Wilderness of Sinai, the place where God promised to dwell among his people. 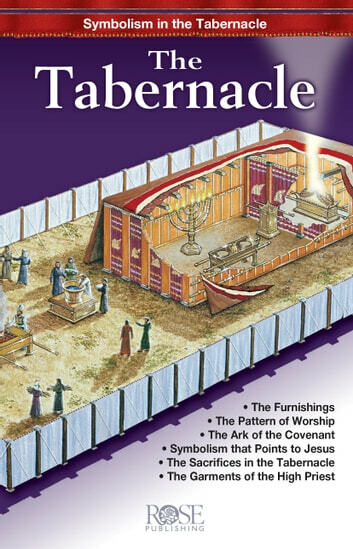 The full-color ebook features a cutaway illustration that provides an inside look at the Tabernacle. The artist's illustration indicates more than 15 important features of the Tabernacle, such as the Ark of the Covenant, the High Priest, and the Sacrifice, and how they relate to our relationship with God today through Christ. 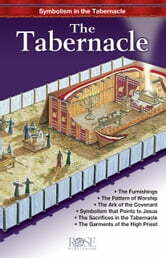 The Tabernacle pamphlet illustration, created exclusively for Rose Publishing by renowned Bible artist Stan Stein, provides an amazing inside look at the Tabernacle and all its furnishings. But this visual teaching aid not only explains the Old Testament Tabernacle in detail, it also helps young and old alike understand the symbolic relationship between the Tabernacle and Jesus Christ. 3. Old Testament Symbols of Jesus, including Old Testament and New Testament Bible references. •Ending in 500 BC when Jeremiah prophesied that the Ark would be replaced by the Lord's presence. "If you go to the Facebook page The Tabernacle Journey you will see our efforts to reach out to Sedona and our many tourists with a full-scale reproduction of the tabernacle. We actually used the Rose book to prepare the groups that were waiting to enter. One guest ordered a copy from you. It was very helpful. I attached the script we used for our guides. We had about 1000 visitors go through before one of the worst storms I have ever seen here made the structure unstable and the ground too wet. We fight quite a battle here in what the New Age calls its capital. Many were very moved. One Jewish man exclaimed at the end of the tour, 'So the tabernacle was all about the Messiah!" --- Paul Wallace, The Tabernacle Journey"
Gives a clear and concise overview of the Tabernacle, it's dimensions, materials and how and why it was used. Excellent.